The REV’IT! Freestyle boots have an interesting no-laces design. They’re comfortable with a good peg feel. Relatively light weight and the upper section is very flexible for walking. Claimed waterproof and uses breathable membrane. It took a while, but I’ve become a short motorcycle boots believer. All of the shorter-height boots I’ve tried are much more comfortable than racing style boots, and this goes double (or triple) for walking. Thanks to the street/stunt crowd, short boots are now cool. Don’t get me wrong — I don’t have a problem with race-height boots. I still wear them more often than not and they usually don’t get a second look when I’m cruising the aisles in the local moto shop. But try wearing a pair into a non-motorcycle store and they’ll figure you’re from another planet. Uranus maybe? And it gets worse: some race boots (like my favorite Oxtar TCS Sport boots (review)) squeak and creak enough to wake the dead. They attract way too much attention for anything other than riding. The boots, that is. So it’s interesting to note that I can walk into a restaurant — well, a diner anyway — with these REV’IT! Freestyle boots under a pair of jeans and not an eyebrow is raised. Unless a fetishist is secretly eyeballing the under-table footwear, I can pass for any other working-class stiff looking for a short beer and a steamin’ plate o’ grub. The Freestyle boots are about as comfy as you can get, too. Their most unique feature is the absence of shoe laces, which bothers me not one whit. 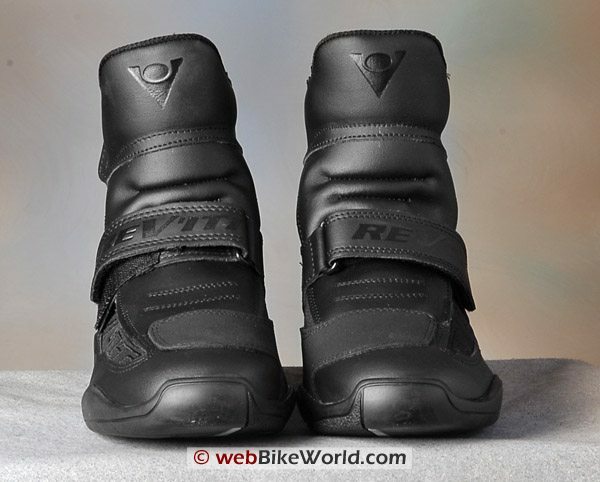 The entire top folds forward, much like the Roadgear TDF boots we reviewed about one year ago. 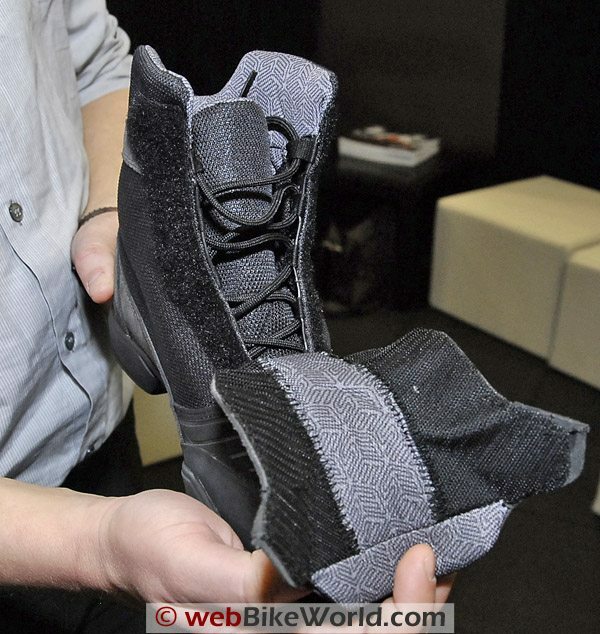 The fold-over system on the Roadgear boots was too fussy though, and it didn’t close tight enough, but the REV’IT! design works much better. Sure, it is different and it feels rather strange at first, but the nicely padded tops provide a cushy ankle surround. And the hook-and-loop is nearly hidden when the boots are secured, so they don’t look like those no-lace sneakers favored by nursing home patrons in walkers. I actually didn’t even realize that the REV’IT! Freestyle boots were missing the laces until after the first time I put them on, believe it or not. I didn’t notice it in the catalog photos and I didn’t even notice it when I opened the box. I managed to get them on the first time and then after I took them off and looked them over, I realized that they were designed to fold forward. The fold-over tops are attached to the boot using the same waterproof membrane material to form a gusset on either side to maintain the waterproof integrity. The gusset is wider on the outside than the inside, which led me to discover the trick to putting them on. Rather than pulling the entire front back to the boot in one piece after your foot is inserted, it seems more efficient to first attach one side or the other (I prefer the outside) to the hook-and-loop. Then pull the other side tightly across the front of your shin and push the hook-and-loop together on the other side. This seems to make the boots fit the way they should, nice and tight. If too much room is left in the front, the puffy tongue can cause your pant legs to get hung up and you’ll end up with your pants up around your shins. Which, by the way, is one of the cautions when wearing short boots. 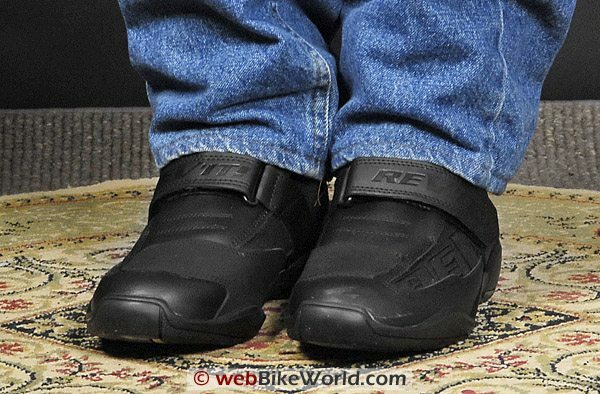 Since they are designed to be worn under the pant legs, the rider must make sure that the pants are long enough to cover the short boot top. Motorcycle pants are usually worn about 50-75 mm (2-3″ or so) longer than normal anyway to account for the bend of the legs on the foot pegs. But be warned that a pair of normal-length street pants will most likely be too short to wear with any short boot. The REV’IT! Freestyle boots are pretty light also; each boot (size 44) tips the scales at only 684 grams (1 lb. 8-1/8 oz.). 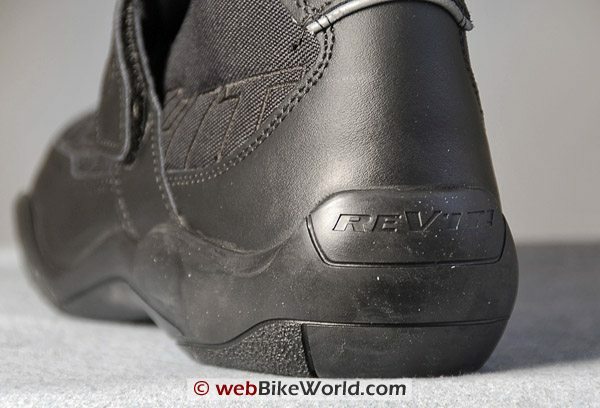 The soles are motorcycle stiff-ish and with just a touch of padding in the footbed, they give an exceptionally good feeling for the pegs, which is important because this is one of the primary unconscious pathways for feeding bike feel to the rider. They have more protection than most street boots, but not as much as full race boots. The malleolus (bones that stick out on either side of the ankle) are protected with thermo-formed inserts. They’re not the hard armor found in a race boot, but they do offer good protection. 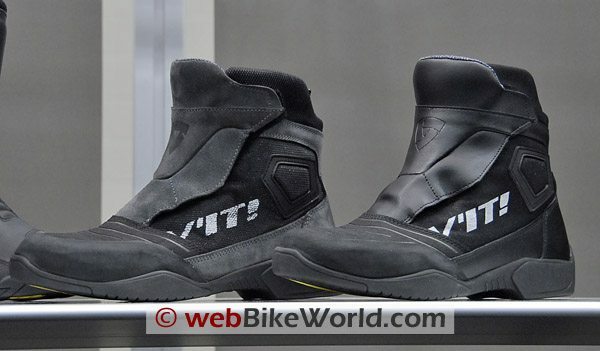 Both the heel and the toe also have the thermo-formed inserts, so the Freestyles all told offer better theoretical protection than just about anything short of a race boot. The uppers are made from real leather and the toes have a nice, big, long extra wear patch sewn on that continues down the inside of each boot. 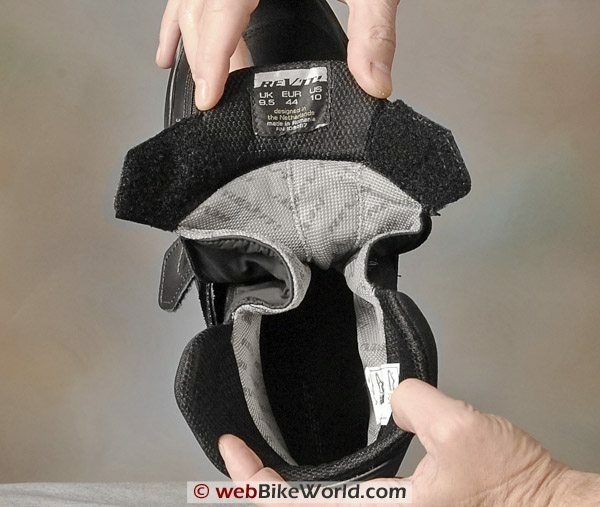 This is a very nice extra that helps protect against wear if the boots are rubbing against the frame of the bike. A large hook-and-loop strap covers the front of each boot and it can be tightened up to make sure the boots stay put. I was surprised to discover that the Freestyle boots are very difficult or impossible to pull off when the hook-and-loop is located and secured correctly, so there shouldn’t be any worries about the absent laces. The boots also have a big pull ring at the back of the heel to help yank the boot up on to the foot. I hope the loops stay on — they appear to be glued in between the fabric rather than sewn, although the holes associated with sewing may have made the strap weaker. The soles are rather flat, and I think the heel/sole interface could have been a bit more defined, because I’d rather have a chunkier heel that I can firmly shove up against the pegs now and then to locate my foot. And REV’IT! 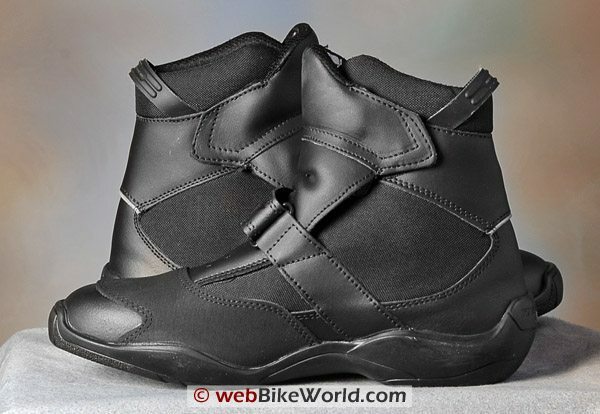 says the soles have steel reinforcement, which is a definite plus and which is usually missing from less-well-designed motorcycle boots. The soles are also slightly less sticky than I thought they would be. 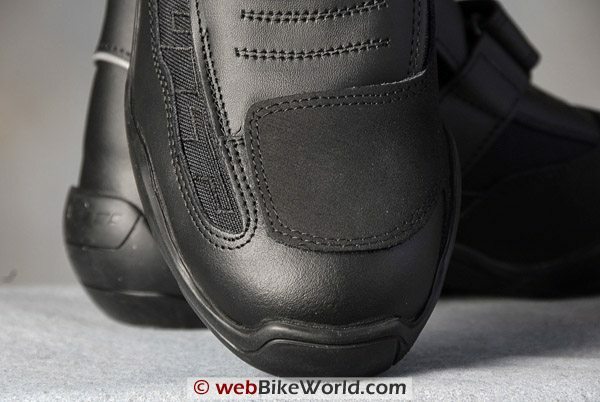 I’ll give up sole wear any day to get sticky rubber underneath, because it helps give critical traction when paddling the bike around or holding steady at a stop light on a slope. They’re not bad, and better than most, just not as super-sticky as I’d like. The soles are claimed to be oil and fuel (petrol) resistant. The rest of the boot uppers are made from our old friend, Cordura and the waterproof and breathable membrane is Hydratex, used in other REV’IT! clothing. And finally, this wouldn’t be a REV’IT! product without a touch of style: the REV’IT! logo is discretely sewn in to the Cordura fabric on the outer side of each boot; it can be seen in the photos above. The REV’IT! 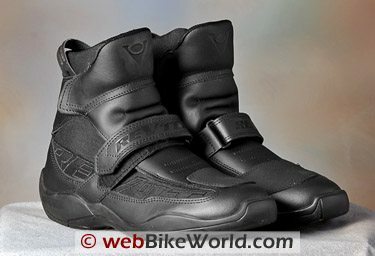 Freestyle boots are a successful cross between a “normal” high-topped motorcycle touring boot and a short street/stunt boot. They’re nearly as comfortable as street boots and they work great for touring or for casual trips to the store. REV’IT! showed a revised version of the Freestyle boot at the 2008 Powersports Dealer Expo (see our report) in Indianapolis in February of 2008. They’ve incorporated your feedback and added laces to the boots (here’s the REV’IT! 2008 online catalog). 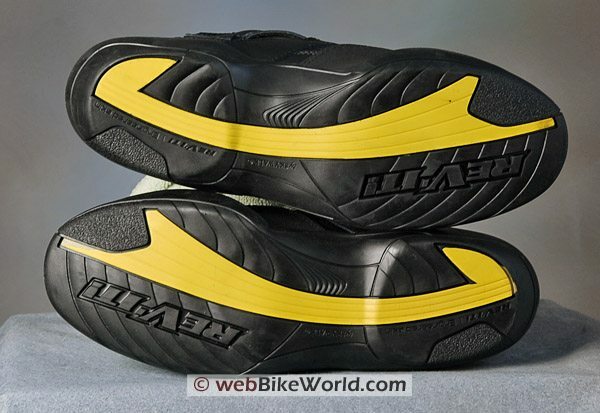 They have also completely redesigned the soles, with an interesting “wave” shape that cants the shoe into the correct position when riding on foot pegs. But that also takes into account walking on smooth and rough surfaces. The Freestyle will also be available in a summer mesh version (the “Air Blend” left in photo below) and a waterproof version (the “Fighter” right). 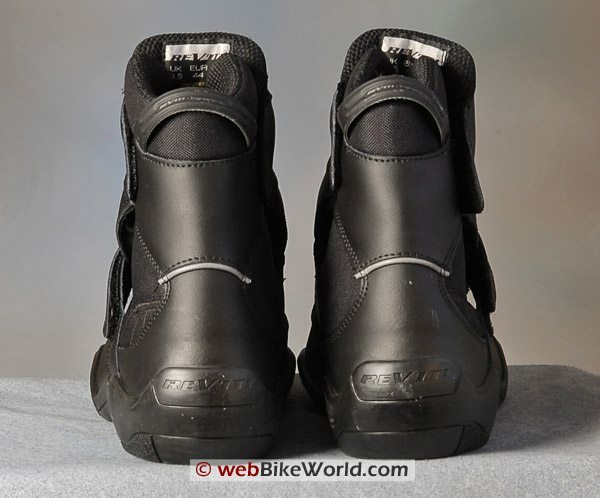 From “L.S.”: “Just my two cents worth – I owned a pair of these a while back and really liked them…for less than a year. After that, the top part that uses hook and loop to secure the boot around the tops of your ankles wouldn’t hold. That’s the part that has continual on-again/off-again pressure put on it as you walk. From “F.F.”: “I have owned these boots for more than a year and they are quite comfortable for all day wearing. They are also totally waterproof. Unfortunately even my longest motorcycle pants tend to slide above the top of the boot causing water to leak into the boot from the top in the rain. I have solved this problem with a pair of Scrambler gaiters. These are stretchy so that they seal off the top roots very nicely. They also have metal hook on the bottom of the front that attaches neatly to the strap that goes across the front of the boots to keep the gaiters in place. The gaiters are also waterproof so the whole system works fine when attached correctly. The second problem I have with the boots is that the side hook-and-loop fasteners tend to come undone when walking more than a few steps. This is also neatly fixed with the gaiters. However, putting the boots and gaiters on each use sort of defeats the purpose of the whole low boot thing.